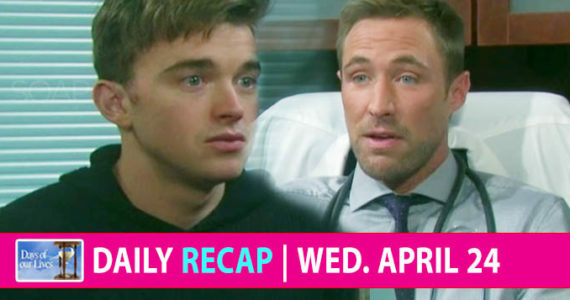 Which Johnson Brother Should Jade Choose on Days of Our Lives (DOOL)? With her romance with Joey on the skids on Days of Our Lives (DOOL), Jade might want to consider hooking up with his half-brother, Tripp. Joey (James Lastovic) has made it pretty clear he’s not interested in pursuing things with Jade; not that that’s stopped her from doing everything she can to keep him by her side. If Jade can’t find a way to get her estranged boyfriend back, she might want to look elsewhere for romance; like in the direction of Salem newcomer, Tripp (Lucas Adams). It wouldn’t be the first time a gal’s bounced from brother to brother on a soap. Over 4,500 fans weighed in when Soap Hub asked which Johnson brother should Jade be with on DAYS. Jade (Gabrielle Haugh) is the neediest girl in Salem and shouldn’t be with either Johnson brother, say 68% of you. She needs to get herself together, first; find out who she is and learn how to stand on her own two feet. Then, and only then, should she even think about embarking on a relationship. Once she does, Jade should probably steer clear of Joey and Tripp. They’ve got too much family drama going on, and she’s got enough of that in her own life. Since her romance with Joey was a major fail, 27% of you are open to Jade hooking up with Tripp. He seems like a nice guy and could probably use someone to lean on, while he tries to figure out his newfound family. Being there for Tripp would give Jade someone and something else to think about besides herself. That would certainly be a nice change of pace for the self-centered teen. Some 6% of you are pulling for Joey and Jade to work out their differences and reconcile. The pair reached a turning point in their relationship, when Jade was pregnant. Joey was there to support her, and Jade’s softer vulnerable side emerged. After Jade’s unfortunate miscarriage, the two teens grew closer, only to drift apart in recent months. You’d like to see them rediscover their love and reconcile.